He was working in a bank when he was charged with embezzlement. At first he attempted to avoid jail by running off to Honduras. While he was there he wrote Cabbages and Kings in which he used the term "banana republic" thus launching the phrase commonly used today. He came back home when his wife was dying and was sent to jail. Fortunately when he was 19 years old he had become a licensed pharmacist, a profession that stood him in good stead while incarcerated. He got to work in the prison infirmary and live in a room near it rather than having to spend time in a cell. In his free time he wrote. He published 14 stories during the three years he spent in jail, using different pseudonyms. 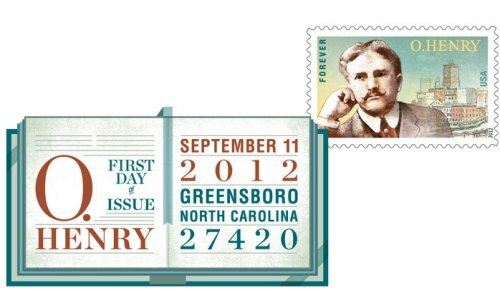 It was during this period that the pen name O. Henry came into being. He was 47 when he died on June 5, 1910. He was a heavy drinker and had cirrhosis of the liver as well as diabetes. First seen in 1919 when high school teacher and stamp collector George Grinnell claimed to have discovered dozens of rare early Hawaiian stamps, the Grinnell Missionaries have become perhaps the longest running controversy in stamp collecting. To this day experts and collectors alike still debate whether they are clever forgeries or the find of a lifetime. Famous Edward Hopper painting Morning Sun is part of La Poste's long running Musee Imaginaire art stamp series. Danny Thomas, who would have celebrated his 100th birthday in 2012, was the beloved star of The Danny Thomas Show (Make Room for Daddy) television situation comdey and known for his roles in The Jazz Singer, and I'll See You In My Dreams. This First Class stamp was issued by the United States Post Office in his honor.